Estuary, Seán Street's sequence of poems about rivers, harbours and tides was first set in musical form by Neil Campbell with vocals by Perri Alleyne-Hughes, and premiered at the Writing on the Wall Festival, Liverpool, in May 2015. Now, a CD studio recording has been issued, launched at the 2017 Festival at The Capstone Theatre, Liverpool in May. 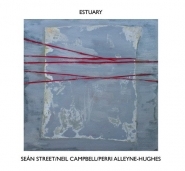 The album can be ordered here: https://neilcampbell.bandcamp.com/album/estuary or purchased from News From Nowhere Bookshop, Bold Street, Liverpool. The CD is presented in a glossy gatefold sleeve, featuring an original acrylic artwork, 'Fog Music 2' by painter and printmaker Jemma Street.